The Anime Film Festival, created for anime fans, will feature 4 brand new anime movies and 2 classic series. The highly anticipated Sword Art Online the Movie: Ordinal Scale will be released together with this film festival. The Anime Film Festival is completed with a series of activities such as Choppa Balloon Display, Yugioh Tournament, Playstation 4 kiosks and cosplay wefie competition at City Square Mall. Advance Sales: 9 Feb 2017 except Genocidal Organ which will be released on 23 Feb.
For more event information please visit: https://www.facebook.com/ODEXanime. 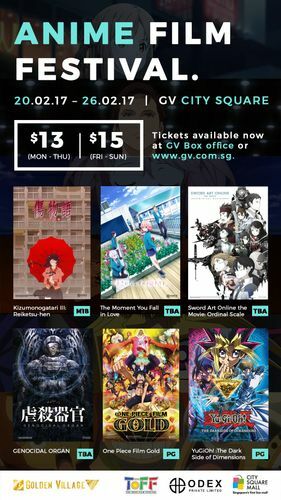 Please purchase your tickets via: https://www.gv.com.sg/GVGroupSynopsis#/group/215cfcc1-209c-4cd8-adaa-251ae84a5115.